These days, much of the best information available in any area of human endeavor is found on blogs. Litigation and trial topics are no exception. An excellent blog keeps readers up to date and interested in a subject far more effectively than a textbook or even a website. And most blogs are free of charge. Everyone should keep up with blogs in his or her own field. It’s a basic idea of staying abreast of what’s new in your profession. Here is a list of 14 blogs that will be of continuing interest to the trial lawyer, whether aspiring or accomplished. They deal with key issues of courtroom technology, trial tactics, evidence, and persuasion in a sprightly manner. The Litigation Consulting Report. This, of course, is the blog of A2L Consulting – the one you’re probably reading right now. Persuasive Litigator. Here, Dr. Ken Broda-Bahm, a litigation consultant, provides valuable tips on the science of persuasion that are applicable to pre-trial or trial settings for jury trials, bench trials, and arbitrations. Science, Business & Law. Innovative Science Solutions, which provides litigation consulting on scientific subjects, explains in clear terms the science behind subjects that can come up in trials. For example: How does caffeine work in the body, and what quantities are considered safe? Complex Litigation Blog. A New York lawyer summarizes a host of recent cases in areas relevant to complex litigation, such as evidence, civil procedure, and privilege issues. Trial Lawyer Communication Tips. A California lawyer analyzes the ins and outs of communication, both verbal and nonverbal. Cogent Legal. Here, a litigation support and graphics company explains how to make effective courtroom presentations. Deliberations. A publication of the American Society of Trial Consultants, this blog discusses trial tips, tricks and foibles in a chatty manner. The Jury Room. Keene Trial Consulting, a trial consulting firm based in Austin, Texas, discusses issues such as juror decision-making; how to uncover juror bias; how our values, attitudes and life experiences affect our decisions; and what characteristics of a witness make him or her believable. Court Technology - Trial Presentation: Ted Brooks, a Los Angeles-based trial presentation and legal technology consultant, provides articles, reviews, and news of interest to lawyers and other legal professionals. The Jury Expert. This blog focuses on issues having to do with jurors: What about jurors who use Google during deliberations? Or jurors who send text messages? Can a litigant legitimately try to exclude gay jurors from serving on a panel? Mass Tort Litigation. Edited by several law professors and a part of the Law Professor Blogs Network, this blog looks at mass tort and civil justice issues from a number of perspectives. JAMS ADR Blog. One of the leading nationwide arbitration and mediation companies discusses all sorts of issues related to alternative dispute resolution. PatLit Everything you could possibly want to know about patent litigation: Who’s suing whom, what the rules are, what the rules ought to be. The Red Well Blog: The Red Well is a service of the American Society of Trial Consultants -- a one-stop opportunity to browse opinion and analysis on the subjects that I care about most deeply. This includes litigation communication, persuasion, advocacy, and psychology relating to trial and pre-trial settings. It would be easy to add to this list. 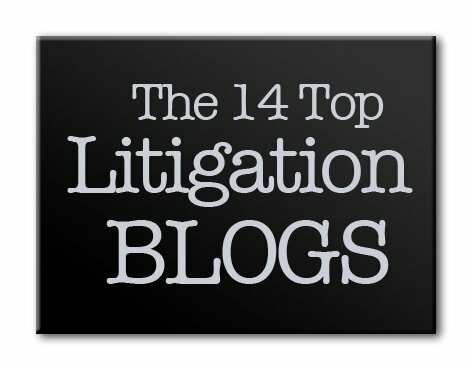 There are plenty of interesting and helpful blogs out there in the areas of trial techniques, trial graphics, trial advocacy, and communication styles. Please share your favorite litigation blogs in the comments.